Possibility of SW Summer Monsoon? Interesting that the latest NMME and IMME seasonal and monthly mean forecasts for April to October 2014 are now available at www.cpc.ncep.noaa.gov/products/NMME/ are suggesting a rather active SW Summer Monsoon. This trend continues from last month’s run. Probably a hot summer in the NW if that is true. It seems like troughs in the NW kill the monsoon to some extent. Troughs in the NW tend to cause the Four Corners High to be suppressed to the south and east of its usual location, creating dry southwesterly flow over the SW deserts for much of NV, CA, and AZ. This happened to an extreme in the very cool summer of 2010 and to a slightly lesser extent, the summer of 2011. The last couple of summers have had a very active summer monsoon, and there was a ton of monsoonal moisture over my area last summer. If El Nino does develop, the SW monsoon will likely be more active this year with a much higher chance of moisture from decaying eastern Pacific tropical systems being entrained into the flow. Even areas in Socal west of the mountains may have an elevated chance of some summer showers and thunderstorms if everything comes together just right. 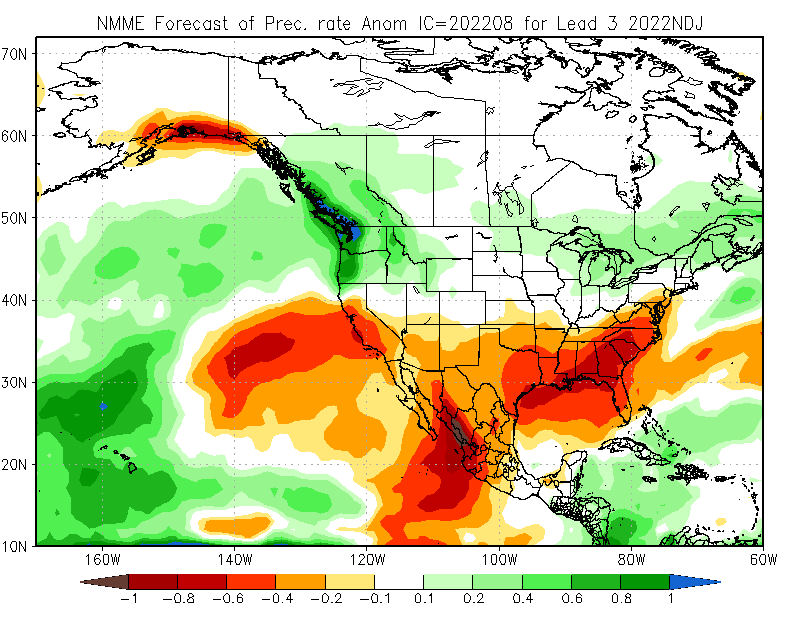 There may even be more of a monsoonal moisture intrusion further north into Norcal, Oregon, Washington and other places further east at times this summer, as western ridging is more favored during an El Nino summer. With el nino in the works I tend to favor an active monsoon based on climo. But beyond that the general trend of not sending systems south should help the interior heat up more quickly and get the monsoon going. I would say about a 60-70% chance of an above average monsoon at this point based on these things but a lot of time for things to change still. As I recall, some of the big no-show SW monsoons have occurred with El Nino. The idea has been that the enhanced subtropical jet shears off the northward flow of subtropical moisture. I don't expect this to be a record-setting EN, so I guess that anything is still possible. I am not betting on a big monsoon this year however. As always, effects of ENSO are only best guesses. I could definitely see what you are saying happening, even if for now I am thinking otherwise. Thanks for the input! I am going to be doing an extensive road trip the first week of August in the Southwest. I will be looking forward to some amazing storms! Nice, I like it. Do you have any thoughts Prism? Looks like things are progressing nicely. Looks like very strong +PDO conditions have set in along with the strengthening el nino. We have much above average water temperature along the entire west coast. This has fueled the strongest may Hurricane on record in the east pacific with Amanda at 155 mph right now. Anyway all this goes to show we should have above average chances of getting some monsoonal moisture into the SW. I still believe this will be a good monsoon season for the SW especially if El Nino continues to develop and additional moisture from the remnants of Eastern Pacific tropical systems is entrained into the region. It looks like everything is going well. Strong western high building in. Continued activity in the pacific, and a good fetch of moisture being drawn in now. Could be an exciting summer for the monsoon. I know there was a lot of flooding in southern Utah today. There were a few isolated heavy thunderstorms in the mountains of Socal this afternoon with the first influx of monsoonal moisture of the season. I still believe that this could be a really good monsoon season for the SW U.S. in general. Even Phoenix picked up some rain. That is good news. They desperately need it, and hopefully they get more as the summer wears on. A nice surge of moisture still looking likely all the way up to my area Wed-Fri or so. Hopefully your area receives some much-needed rainfall during that time frame. I think we will get at least one moderate soaking Dan. How about you, any chance down there? There is about a 20% chance of showers / t-storms for the mountain and high desert regions for the next couple of days, but no activity expected in the coastal and valley areas. However, the chance is iffy because most of the moisture plume is east of the region. The southwest radar is filling in this afternoon. There's even some color in California. Yeah I see that Chris. Lots of showers and storms in central Utah right now too. Kind of interesting...your monsoon actually sparked a shortwave which made it all the way over here in the form of a big MCS. A mesoscale convective system. The simple answer is a giant blob of thunderstorms...but I think I posted a module in the met 101 section if you want more info.